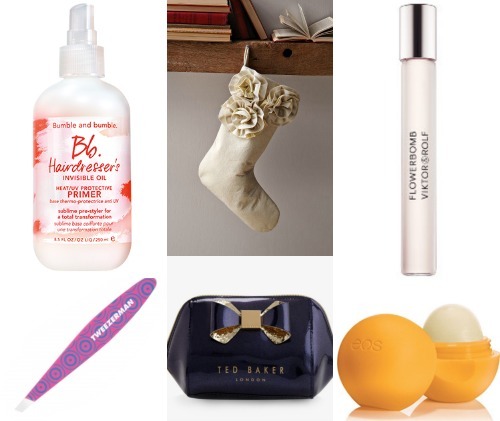 Today we have another beauty gift guide but it's products all under $50! Take it away Amanda of @Beauty_Cache! Hair Primer: It’s so tough to keep my blonde hair from drying out ,so I live by primers and masks. I can never have enough protection from the dry climate & hair dryer double-timing it in winter. I love this primer and would love to see a fresh bottle appear in my stocking. I can use all the help I can get. Tweezers: I think tweezers maybe undervalued when it comes to the best gift. They literally should be in everyone’s beauty kit. From applying fake lashes to making a chin hair disappear, tweezers fix it it all. They may not be crucial to my look but they save the day. Tweezerman’s variety of designs make picking the perfect one fun and very character revealing. Cosmetic Bag: I love getting new cosmetic bags and I can never have enough. They are fun to switch up for the seasons, for travel or just for fun. Just make sure it’s big enough to fit the good stuff. I love the design of Ted Bakers cosmetic bags and am obsessed with navy trend this year! Lip Balm: EOS are my favorite go to lip balm to keep my lips smooth. I can’t wait to get my hands on the new tangerine flavor offered at Ulta. This will come in hand on the slopes for sure since the twist top makes it east to open and close in my gloves! Rollerball Fragrance: The deep floral notes of the Flowerbomb fragrance takes me back, and the roller ball option allows me take it on the go, which is great for a busy work day! Thanks, Amanda! Follow her Instagram. Flowerbomb is the best perfume! !